Children who fasted for the first time yesterday, the most sacred day of Ramadan, Laylat Al-Qadr (the night of destiny), were honored at Palais Tazi, by the Rabat Commune, the International American Women's Club, and several orphanages. A number of VIP's attended the ceremony including the US Ambassador Thomas T. Riley accompanied by his wife, the mayor of Rabat, and wives of foreign Ambassadors to Morocco. 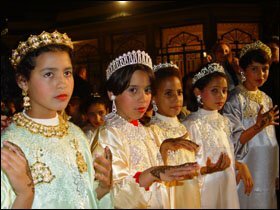 The young girls were decorated by a Negafa, a woman who traditionally dresses the bride for her wedding, in Moroccan clothes and accessories. In the open square of the Palais Tazi, the Negafa adorned the girls' faces with makeup and tattooed their hands with Henna. Along with orphans, many parents came to celebrate their children's first day of fasting and to express their happiness. Despite the rain, children danced and sung along with the Moroccan traditional music. Laughs and screams were everywhere as girls rushed to get their pictures taken in their extravagant outfits. A melting pot of food was prepared by the wives of the foreign Ambassadors to Morocco, who were wearing traditional clothes of their own countries.